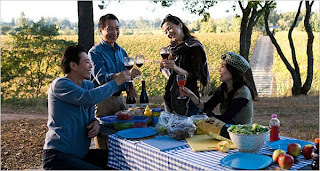 In case you hadn't heard, a Japanese-language remake of "Sideways" is coming out in October, made in Napa Valley with a mostly Japanese cast. This New York Times article describes it as well as anything written up to now in English. Since I have a book out in Japanese about northern California wine country, I'm unabashedly rooting for the new "Sideways" to be a big hit. You'd think wineries would be as well, because they could use a wave of tourism from people willing to spend money. I have to say, though, that I don't get the feeling from most wineries that the Japan market matters to them. The movie could change that, but we'll see. Anyway, Fox Japan has launched a website with a trailer for the movie. If you're curious, check it out. The cast is a good one, with actress Rinko Kikuchi mildly familiar to Western audiences from her appearances in "Babel" and "The Brothers Bloom." I've talked to just three people who have seen the movie. One, who knew nothing about wine, loved it; she said the characters were amusing and she loved the changes to the script. The other two were food writers, and they both complained that the movie has lost its reliance on wine as a metaphor for the main character. It's set in Napa, so it's not about Pinot Noir anymore, which means there's no finicky, difficult Miles personifying the grape. The film starts in San Francisco, where one Japanese expatriate is stationed and is awaiting his impending marriage. They head up to Napa and apparently have very similar adventures as the original Jack and Miles, including the spit bucket incident and even the sexual adventures. I'm told Kikuchi plays a Japanese-American who speaks comically bad Japanese in the movie; she will be the one swinging out with righteous wrath (but not a motorcycle helmet). I've also been told that the ending differs from the American version. I'm going to see the movie in Napa on Sept. 27, and I don't want to spoil it for people who will see it there. But I will write a full deconstruction, dripping with spoilers, after I see it, under the theory that very few English speakers are ever going to see this film. I'll put a big SPOILERS ALERT at the top. In the meantime ... Gambatte "Sideways!" California wine can use the boost.